Each spring, the University recognizes one faculty member who has shown exemplary strides in creativity, research and scholarship. This year, Dr. John Bawden, associate professor of history, was formally honored with that distinction during UM’s 121st Founders’ Day on Oct. 12. “Dr. Bawden certainly is a fine representative of UM’s model of excellence as a scholar-teacher,” wrote Dr. Ruth Truss, chair of behavioral and social sciences in a nomination letter for Bawden. 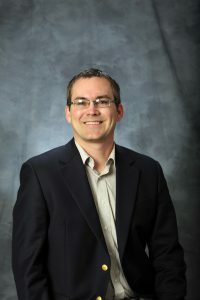 Bawden received both his bachelor’s and Ph.D. in history from University of California, Riverside. He left the sunshine state to join the UM faculty as an assistant professor in 2009. Bawden’s primary research focus is on the South American militaries, U.S.-Latin American relations and the Spanish conquest. The text examines the training, memory, and professional formation of Chile’s officer corps, which shaped the historical outcomes of the near 20-year dictatorship of former Chilean president Gen. Augusto Pinochet. Since coming to UM, Bawden has delivered five invited lectures on his research, served on several university committees and received numerous travel grants and fellowships. “The committee was rightly impressed by depth of his work and the clear enthusiasm with which he has shared it in the UM community. In that sense, his scholarship is a visible, positive presence and an inspiration to students and colleagues alike,” said Dr. Jim Murphy, professor of English and the current head of the University Scholar selection committee. During the Founders’ Day ceremonies on Oct. 12, Bawden received a monetary award and commemorative plaque. His portrait will also permanently hang with previous University Scholars in Carmichael Library.